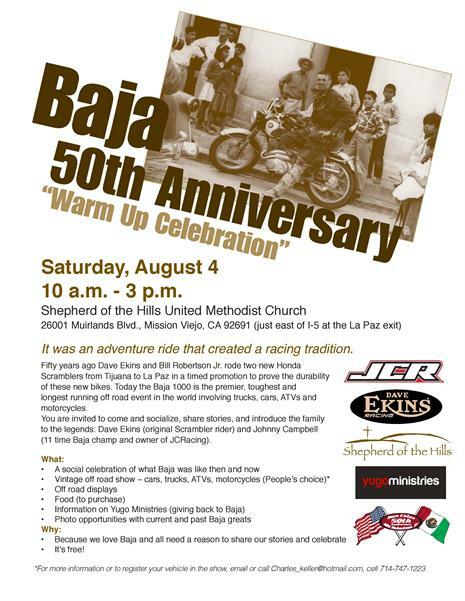 As you will see in the flyer, this is an invitation to come celebrate the 50th anniversary of Dave Ekins and Bill Robertson Jr’s epic 1962 marathon trip down the Baja peninsula. I have my own related short story that I thought I would share with everyone. My first ever recollection of Baja would come from the movie “On Any Sunday”. While I remember the Baja part, it was the probably ISDT scenes that made a bigger impression on me. Years later, in a subsequent movie, perhaps “On Any Sunday II”, I recall seeing a lone motorcycle racer going across a dry lake bed in a Baja race. I still remember the scene vividly. It was dark and the bike had no lights. It was riding in the light stream of a race truck, off into nothingness. I remember thinking that this was probably the most frightening experience I could imagine doing on a motorcycle. In the dark theater it gave me a chill. I have never met Dave Ekins, but I did work for the late Bill Robertson Jr and his son Billy at Honda of Hollywood. In 1996 I found myself once again in Los Angeles. I walked into the Hollywood dealership and told the sales manager he should give me a job. I had no particular experience, but I finally convinced him to take me on. Among the many things in the dealership, sat this beautiful restored sixties era Honda scrambler. Above it was the poster produced by Honda depicting the ground breaking ride down the penninsula by Dave and Bill. At the time, I really had no understanding about Baja. It would still be another 5 years before I would make my own first trip south. Another salesman in the shop explained the whole thing to me, how this bike belonged to the owner of the dealership and he was one of the riders shown in the poster. Still, it took me some time to understand the meaning of the experience. During slow times, I would stand and reread the copy on the poster. Sometimes the discussion would come up with customers and I would learn new tidbits about the ride and the riders. As for Bill Robertson Jr, he was quite ill and battling cancer at the time. He would be away from the dealership for long intervals. But on the occasions when I did get to talk with him, I always found that he was particularly kind to me. Bill passed away in 2000. I did not see this video until recently. Now that I have traveled the length of the peninsula a few times, I marvel at the accomplishment. I can only imagine how rugged and remote most of the Baja must have seemed at the time. To provide some sense of perspective, even today many riders who attempt to race the Baja 1000 solo would have a hard time matching the elapsed time of the 1962 trip. In 2010 I spent just about 36 hours riding nonstop along much of the same route. Not that I am the only one who has ever done such, but it gives me a special appreciation for the thing. Nothing is quite like seeing it get dark for the second time and you still have many miles to go. Baja has an almost mystical quality that touches nearly all who travel there. An adventure ride that created a racing tradition! Fifty years ago Dave Ekins and Bill Robertson Jr. rode two new Honda Scramblers from Tijuana to La Paz in a timed promotion to prove the durability of these new bikes. Today the Baja 1000 is the premier, toughest and longest running off road event in the world involving trucks, cars, ATVs and motorcycles. When: Saturday, August 4 10 a.m. – 3 p.m.